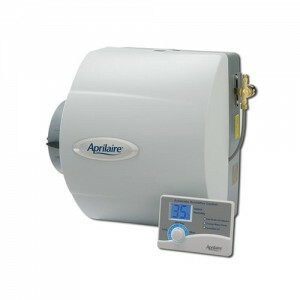 The Aprilaire 600 Humidifier is the best bypass humidifier on the market today. Capable of evaporating up to 4,000 square feet, this 24V whole house humidifier with automatic digital control uses a Water Panel® evaporator to deliver 3 gallons an hour! Easy to use, this Aprilaire whole house humidifier offers the best regulation for home humidity levels while sporting one of the highest evaporation rates in the industry at .70 gallons per hour! In addition, it operates quietly and maintenance is a cinch! The Aprilaire 600 humidifier features a built-in damper which means you can avoid the need for an addional part and it gives you additional control. A small damper handles allows you to adjust the damper. This Apirlaire bypass humidifier features a water panel indicator light so you'll know exactly when to change the humidifier filter. The Water Panel® evaporator shoud be changed at least once per year. Get the peace of mind with an increased comfort with consistent humidity levels in your home. Aprilaire 600 humidifier Must be PROFESSIONALLY INSTALLED by a licensed HVAC professional to be eligible for the Aprilaire 5-year warranty. Warranty is void unless humidifier is installed by qualified heating & air conditioning contractor due to possible misapplication of product. Item Must be PROFESSIONALLY INSTALLED to be eligible to receive the Aprilaire 5-year warranty. Warranty is void unless humidifier is installed by qualified heating and air conditioning contractor due to possible misapplication of product. I simply love my new whole house humidifier. Now the air is always fresh and clean. The amount of dust has been dramatically reduced. I am very grateful for purchasing this product because my house 'feels' clean all the time.